The main technical challenge here, and one which has been met only up to a point, was the tonal "grittiness" imposed on certain instruments, most especially Menuhin's violin, by EMI's primitive tape machines during the recording of the Violin Concerto. It's a form of very fine flutter which is exceptionally difficult to lessen and which has always marred this recording. This aside, both recordings offer particularly fine sound quality following XR remastering - in particular the Symphony recording sounds truly excellent. I've also been able to fix a marked jump up in pitch at 13:15 in the first movement of the Violin Concerto, suggesting the joining of two takes from machines running at different speeds, as well as other pitch anomalies present in the earlier recording. Generally speaking, the basic elements of the solo concerto are Contrast and display. In the solo concertos of Brahms, however, these qualities are minimised since Brahms' approach is essentially symphonic. Indeed, the solo part is so closely woven into the orchestral texture that the two are virtually one. Particularly is this true of the Violin Concerto, in which the solo violin is often hard put to it to make itself clearly heard against the orchestra. Hence, of course, Von Bulow's bon mot that it is a concerto against the violin. The orchestral part of this concerto is so vital and important that one might say that it is as much a conductor's piece as it is a violinist's. Perfect agreement between the two is essential, for the conductor is no mere follower or accompanist: he controls the course of the music just as much as the soloist does. This new recording of Yehudi Menuhin with the Lucerne Festival Orchestra under Furtwangler seems to me to be the result of such an agreement. 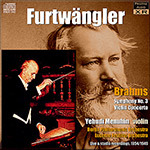 The balancing and dovetailing of the solo and orchestral parts are accomplished to perfection, and, what is more, I am glad to note that Furtwängler faithfully observes Brahms's fairly lavish dynamic indications. Incidentally, I would mention that there are five other recordings in the current catalogues (Szigeti, Heifetz, Kreisler, Neveu, and Ossy Rennardy), and it is remarkable how little they vary in matters of tempi and dynamics. I say this with knowledge of all except the Heifetz recording. During the last few years I have had some hard things to say about Menuhin's playing, which too often shows the signs of wear and tear through this ridiculous and unnecessary fashion of popular artists serving their public like ill-paid and overworked waiters. I wish Menuhin would always play as well as he does for this recording, which is a really careful and thoughtful performance. His playing of the first movement is fine, spacious, and intense. In the slow movement his tone and phrasing do full justice to the poetry of the music, and the emotional expression is properly controlled. The Finale is thrown off deftly and with the right amount of abandon. The playing of the Lucerne Festival Orchestra is very good, although the place where the recording was made would appear to be a little too resonant. There are occasions, too, when one has the impression that Menuhin is playing behind the orchestra rather than in front of it, which is obviously due to the placing of the microphone. "Producer unknown" reads this disc's information regarding the Violin Concerto, and it also wrongly gives September 1949 instead of late August as the recording date. In fact, the recording took place during one of Walter Legge's forays on to the continent. At the Lucerne Festival two years earlier he had caused the symbolic post-war union of Menuhin and Furtwängler in Beethoven's Violin Concerto to be sealed by a recording, and now he followed this with the Brahms. On their expedition EMI's engineers took early tape equipment rather than recording waxes, and clearly the new technique had yet to be perfected, since if the recording isn't exactly afflicted with flutter there is a roughness in the tone-quality which comes from uneven tape running. There is also a good deal of rumble, and one or two poor edits. The performance itself is on a very high plane. Menuhin and Furtwängler enjoyed a very close artistic rapport, and together they explore the Concerto in a profound, very inward fashion. Menuhin is in quite good form technically, and his radiantly lyrical, inspirational playing is well matched by Furtwängler's ardent, highly expressive conducting. The tempo of the first movement is fairly leisurely, but such is the wealth of detail and golden quality of phrase that every moment tells. These artists find an almost painfully eloquent, elegiac quality in the slow movement and there is sharp contrast in the finale, which has a joyous, outgoing spirit, and an abundance of physical energy. The present recording has been made from a relay which RIAS, Berlin, put out from a live concert - Furtwängler's memorable last Berlin performance on the 27th April 1954. Frank Thiess, who edited a selection of Furtwängler's letters in 1964, refers to the fact that as late as May 1954, after conducting Brahms's Third in Cologne, Furtwängler told him that at last he believed he really understood this masterpiece. These words used by Furtwängler toward the end of his life may be taken to show that the 3rd Symphony had been harder for him fully to comprehend than Brahms's other works, so that he had taken far longer in discovering how to present it to perfection. Furtwängler was always triumphantly successful in his interpretation of Brahms's 1 st Symphony, his congenial direction making this work's immediate descent from Beethoven undeniable, and seemingly eliminating its structural weaknesses. Then again, the 4th Symphony in E minor, with its characteristically austere power and tone colouring, particularly appealed to his temperament. Different criteria apply to the interpretation of the 3rd Symphony (which other notable conductors, such as Hans Knappertsbusch and Johannes Schüler, have regarded as the centrepiece of Brahms's symphonic oeuvre). It is of vital importance here - and this is a challenge which has to be met at every performance - to achieve the correct balance, particularly in the first and last movements, between the monumental and the chamber style, i.e. to establish an artistically convincing relationship between these two media of expression. Possibly Wilhelm Furtwängler's words quoted earlier apply to this particular problem - in any event, their significance should certainly not be overlooked. What can one say about these magnificent reissues? These combine live performances (Symphony No. 1, Symphony No. 2, Symphony No. 3,Double Concerto, Haydn Variations, ) with studio recordings. The interpretations are legendary and have appeared often on CD, but now we hear them in Andrew Rose's meticulous remastering which has corrected numerous problems of the originals including flutter, pitch correction, and adjusting balances to provide a remarkably clear, vivid aural experience. The disks of concerted works are particularly memorable, collaborations between musical giants—music making of the highest order. Don't miss these performances, now to be heard in the highest quality restoration.